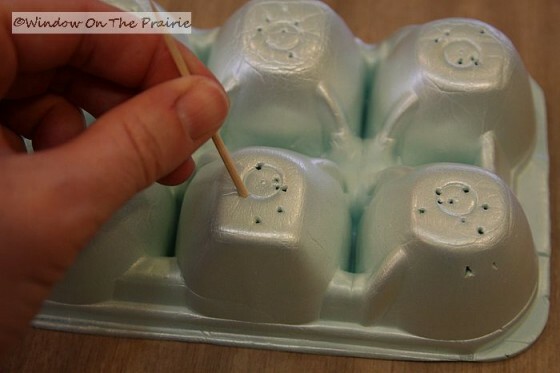 First, take a styrofoam egg carton, and cut the lid and tab away from the bottom. Throw the tab away. Next, using a toothpick, poke holes in each cell on the bottom for drainage. Spread some newspaper over your work surface. I didn’t have any so I used an old seed catalog. 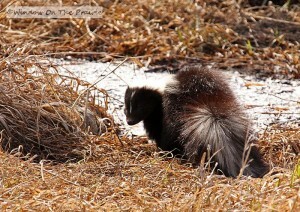 I have plenty of those this time of year. Fill cells will soil up to the very top edge. 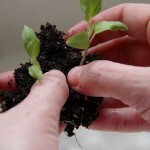 Smooth it over to make it even, but be careful not to pack the soil. 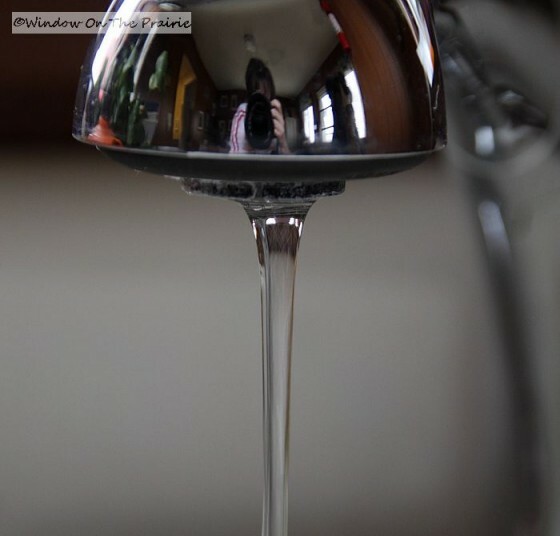 Using warm water, turn your faucet on at a little more than a trickle. 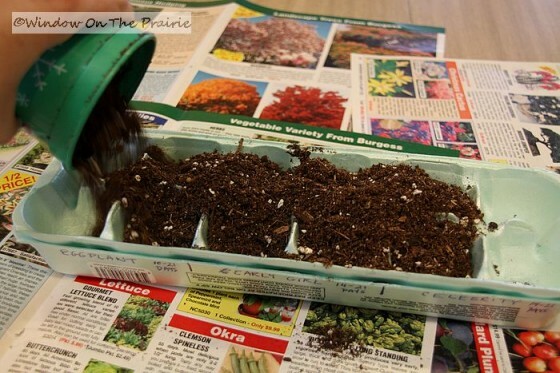 Carefully water in the soil by running the carton back and forth under the water. If it threatens to overflow, stop for a little bit and then continue until water is draining out the bottom from all the cells. Leave to drain in the sink for a while. You’re ready to move on to the next step when water is no longer dripping out the bottom. Mark what used to be the lid of the egg carton, which will now be the drain tray, with what you are planting and how long it takes to germinate. 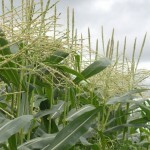 Read your seed packet to determine how deep to plant the seeds. All the varieties I planted were 1/4 inch. 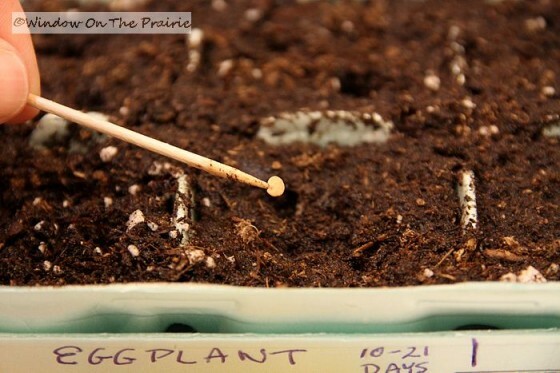 Use a toothpick to dig a hole for each seed. While I only want 4 plants per variety, I planted 8 seeds just to improve the odds. Seeds don’t always germinate when you tell them to. So I dug 2 holes per cell. First I planted the eggplant. 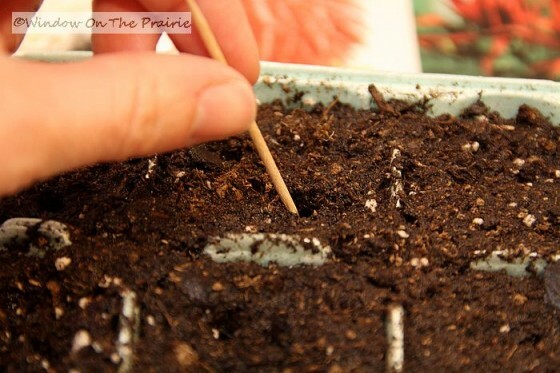 Use a moistened toothpick to pick up the seeds and poke them into the holes. Carefully fill each hole with soil. and finally the Celebrity tomatoes. Next, water the seeds in. 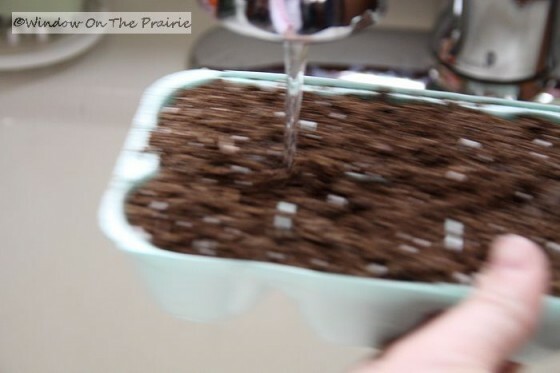 The soil is already plenty wet, but you want to settle the soil around the seeds to remove any air pockets, and watering is the best way to do this. You can use the faucet again, this time turning it on to a fast drip being careful not to disturb the seeds. I use and old mustard bottle that I washed out. It’s more precise. Next, we’re going to made a little greenhouse over the planted seeds. 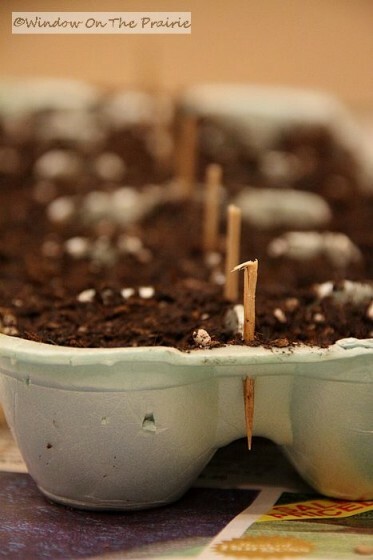 First, break several toothpicks in half, and poke them into the egg carton in a neat row down the center. This will be the greenhouse support. Next, cover the carton with a sheet of plastic wrap tucking it underneath. Finally, place the carton into the tray. 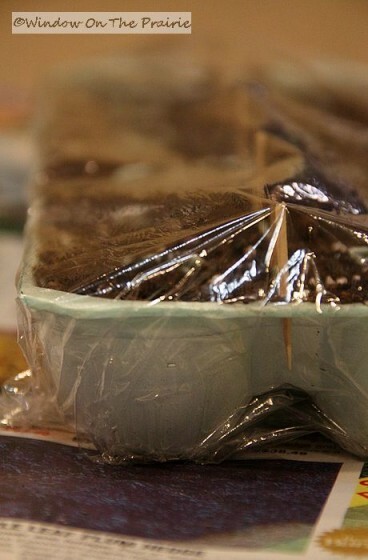 The plastic wrap will keep the soil moist and maintain a more even temperature. 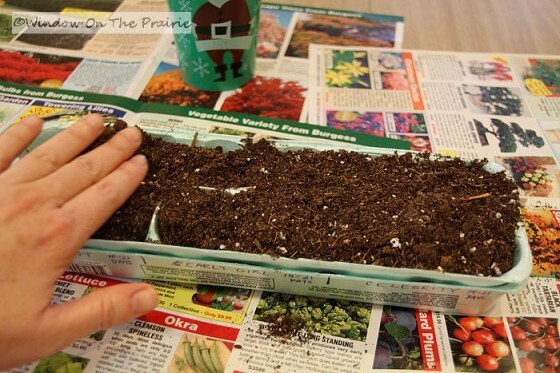 You can place the tray on a windowsill where it will get some sun during the day, and even follow the sun from window to window, or you can place it onto a warmer used for germinating seeds. Years ago I lived in an apartment that had an older fridge that was always warm on the top. I had great luck germinating seeds on the top of that fridge. 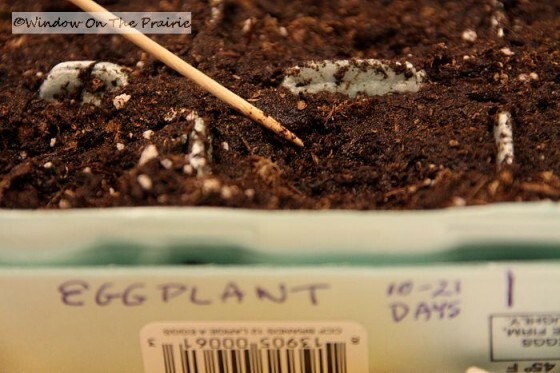 As soon as the seeds sprout and reach the plastic wrap, remove it. 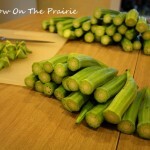 If they are not already in a windowsill, or grow light, place them there. 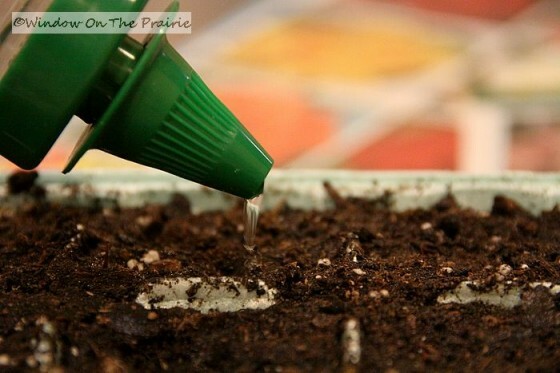 After that you’ll have to keep an eye on the young plants to ensure they don’t dry out. Water carefully so as not to disturb them. Make sure they are getting as much sun as you can give them, or put them under a grow light. 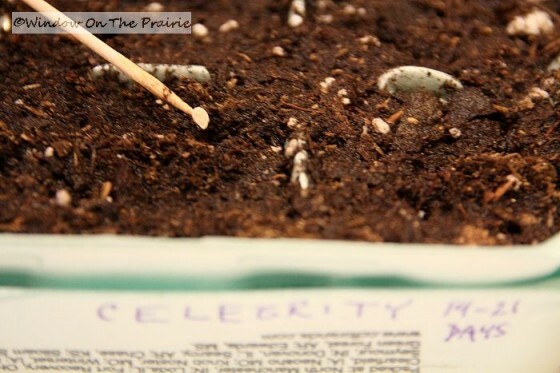 I’ll have another post when mine germinate. And I’ll follow up when the young plants need to be transplanted. ——> UP NEXT: An uninvited resident on the farm. How well organized you are, Suzanne! 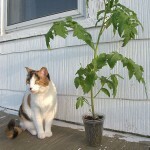 Looks like you are expanding your season of tomatoes. The Early Girls may produce a bit longer as well since they are an indeterminate type. (Vines get really tall). I love eggplant! So many new dishes to try! I like soaking my soil from the bottom. Just takes longer to wet the soil but avoids a washout. Looking forward to your little plant’s progress! We’ve never tried Early Girl before, but are going to because of the longer season. Also never tried Eggplant. Should be interesting. Awesome step by step post. My mom used to start tomatoes this way. 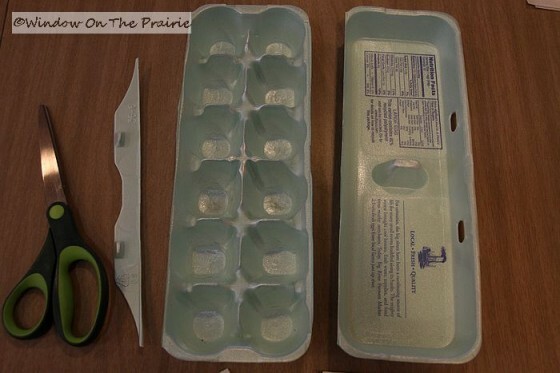 There is always a reuse for egg cartons. 🙂 Love the photos of you watering where your reflection is in the faucet and the blur of moving the egg carton. I hope they all sprout for you. 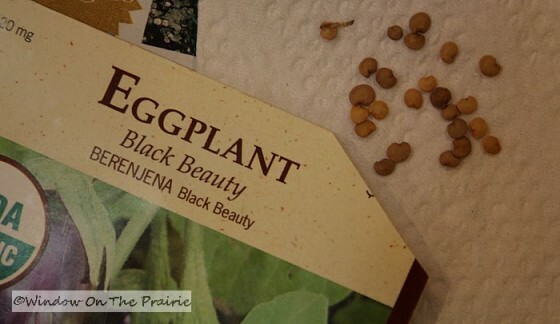 Do you eat a lot of egg plant? I grew some one year thinking if I had homegrown fresh egg plant I’d like it more, but my hubby and I decided it wasn’t for us. We actually don’t eat a lot of eggplant, but do like it and wanted to grow something new in the garden this year, so we thought we’d give it a try. Thanks Gardener! 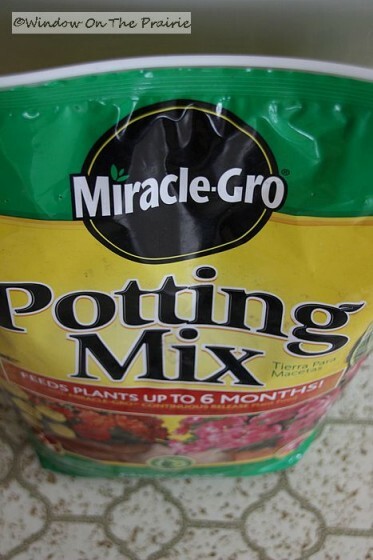 I always use Miracle-Gro potting soil for the pots of flowers I plant on my front porch–it’s well worth it for the abundance of flowers you will get! 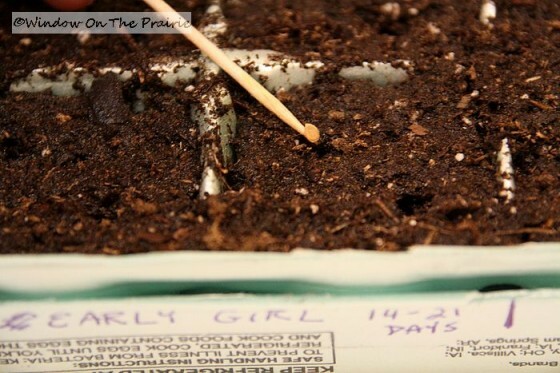 I’ve read that germinating seeds need 16 hours of light each day, so you’re right, it’s a good idea to follow the sun in the windows through the day or use a grow light. You make it look so easy! I’ve never grown plants from seeds. Give it a try Dianna. It’s such fun. Oh yes, it is time! Thanks for reminding me, because I wasn’t even thinking about it, but I need to get my tomato seeds going as well. 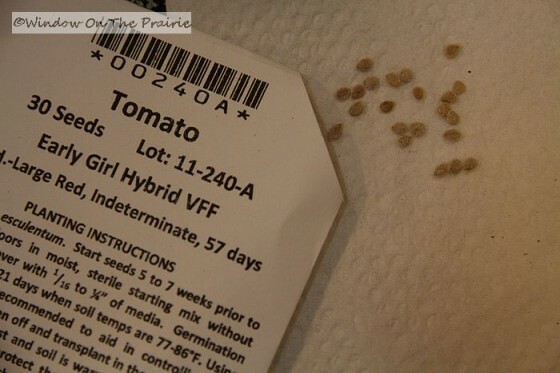 I have a lot of different heirloom varieties of tomato seeds. p.s. I forgot to ask you…did you get my e-mail? I used the one from your contact page. Yep, was great to hear from you. Will be responding soon. This looks like fun. 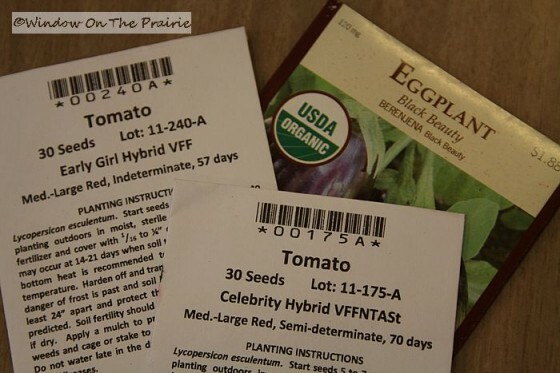 I usually buy starter plants after the frost, but I think I will try this approach this year. Thanks for the great directions, I’ll let you know if I have any success! Great, MarieElizabeth! Let me know how it goes for you. 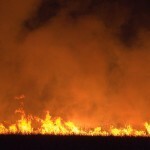 We have had great weather for over a week now and I had to remind my husband it is still too early to plant. Maybe he’ll be satisfied if we start some seeds. Thanks for the idea! You’re welcome SAlly. Harland is getting itchy planting feet too. He’s distracting himself today by planting potatoes in the veggie garden. I tried last year to start seeds indoors. I don’t think there was enough sunlight. None did well. The peppers plants didn’t do well in garden cuz bigger plants overshadowed them. Am rethinking for this year. No beans although they did well. First year of garden last year and it wasn’t a good year for gardens here. Too cold when gardens were to start and it may be that way this year. Will see. Am gonna go small this year with tomatoes and red bell peppers and onions in square ft. garden! Awesome post! 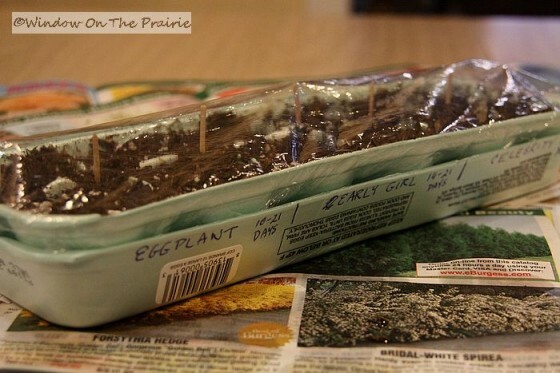 we jsut had a seed planting party and used egg cartons as well for all the kinders. I didn’t poke holes in the bottom though =( Boo! but i will remember this for next time! 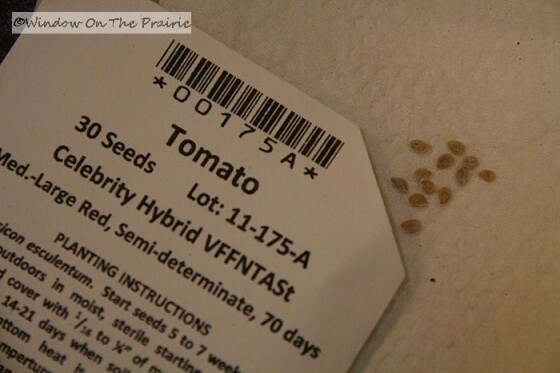 I could just smack myself thinking about the money wasted on seed starter kits! 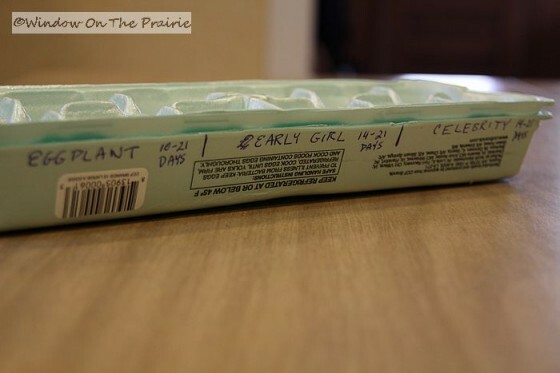 The egg carton idea is genius and next year I will take your advice and go that route from now on! Thanks! !